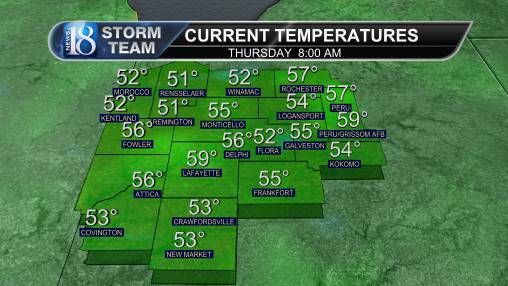 Tracking more unseasonably cool temperatures as snow just misses Greater Lafayette. Greater Lafayette is dodging a bullet overnight. While parts of the state stand to receive more than 6” pf snowfall accumulation before tomorrow afternoon, Tippecanoe County isn’t expected to see much more than a flake tonight. If any parts of the region see accumulation, it will be our easternmost portions of the viewing area, such as eastern Howard County. While our roads will remain clear for the midweek morning commute, conditions will be particularly chilly. Overnight lows will fall into the upper 20s by the predawn hours tomorrow, but winds gusting as high as 15 mph at times tomorrow morning will drop wind chills into the upper teens at times! Cloud cover associated with the passing low will continue to linger across the region up until the afternoon hours tomorrow. Despite the gradual departure of our upper-level moisture early tomorrow afternoon, the northerly wind flow will continue to keep temperatures about 10° below the average high for the day. Expect an afternoon high temperature of just 43° in Lafayette tomorrow. 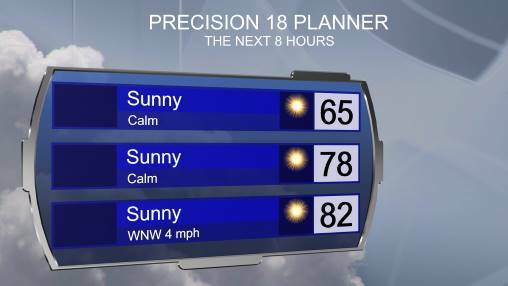 The remainder of the work week appears quiet, but cool. Higher pressure will take the wheel as it flows in behind the passing core of low pressure responsible for the significant snowfall across both the Midwest and New England. With the clearer conditions however, northerly winds maintain their grasp on the state of Indiana. In fact, It’s possible that we won’t see southerly winds return to Greater Lafayette until the beginning of the next work week; just in time for temperatures in the 50s and 60s.